The Lo Lo, also called the Mun Di, Man Di, La La, O Man, or Lu Loc Man, live mainly in the northern mountain provinces of Ha Giang and Cao Bang. Although they are a small population and live among other ethnic groups, the Lo Lo have maintained their own traditions and customs. The Lo Lo were one of the first ethnic groups to settle the Dong Van plateau. 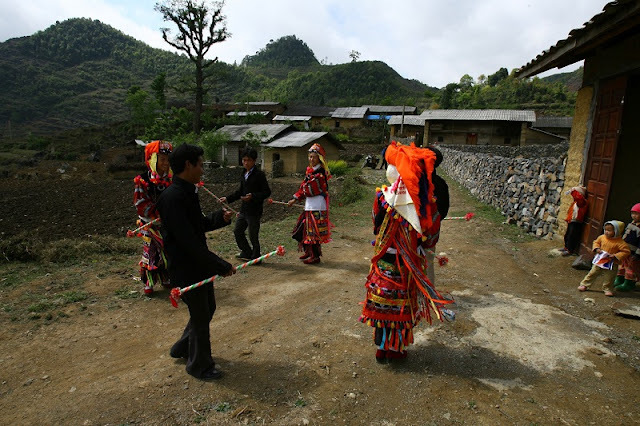 The Lo Lo Den live in Lung Cu commune and the Lo Lo Hoa live in the Lung Tao and Sung La communes in Dong Van and Meo Vac district. 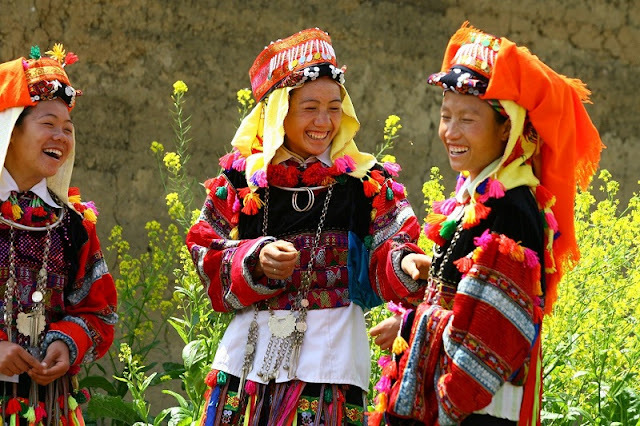 They share the same customs and language, but differ in their traditional costumes. The Lo Lo build their houses up against the mountainside facing their fields. 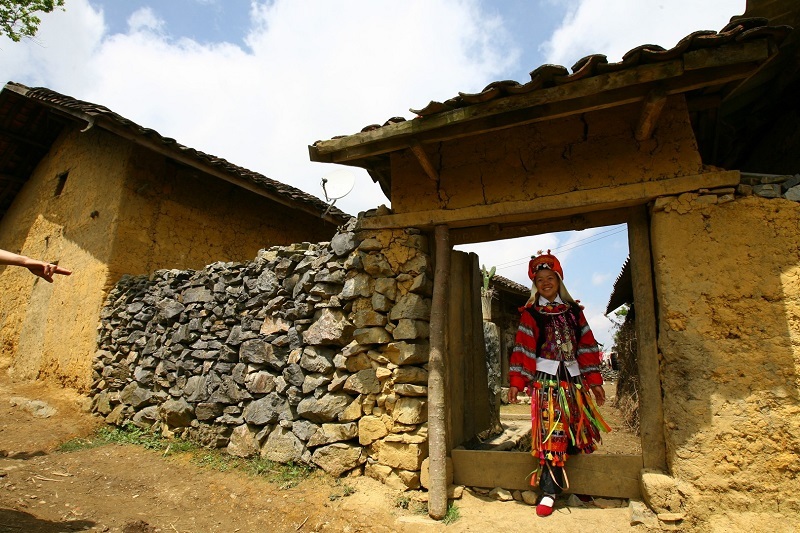 They build stilt houses or earthen-wall houses surrounded by a stonewall. Lo Sy Pao says the outside of a Lo Lo earthen-wall house resembles that of other groups, but the interior is different. “A house has three rooms. The room on the right is for the grandparents and parents. The central room is the meeting room and for worshipping. The room on the left is for the children. The attic is for guests or to store food,” Pao noted.The altar is located in the central room of the house, against the wall opposite the main door. On the altar are bamboo or wood statues of the family’s ancestors. The Lo Lo also worship President Ho Chi Minh. Pao explained, “During ancestral worship ceremonies and on New Year’s Day, we always burn incense in commemoration of President Ho Chi Minh. The Lo Lo consider President Ho Chi Minh their progenitor.” The Lo Lo live harmoniously in close proximity with other ethnic groups while preserving their traditional values. Young people are free to choose their own marriage partner. The groom’s family invites 2 couples as matchmakers to bring marriage offerings to the bride’s family. They give the offerings to and talk with the younger brother of the bride’s mother. He is in charge of approving the marriage and dividing the offerings among the family. When their father or mother dies, children are allowed to get married after one year of mourning. The Lo Lo treasure their old bronze drums which symbolize their group’s power and connect them with the world of the dead. The bronze drums are played during worship ceremonies for genies and ancestors and at funerals. The Lo Lo celebrate many interesting festivals each year, like their picking corn festival and their praying for rain festival. Pao shared, “We organize a rain worship festival in March. All villagers contribute offerings and participate in the festival. Sometimes, the Lo Lo and other groups co-organize a rain worship festival so the whole region will have rain.” The Lo Lo’s costumes are an eye-catching display of sophisticated embroidery. Men wear black pants and shirts that extend to their knees. 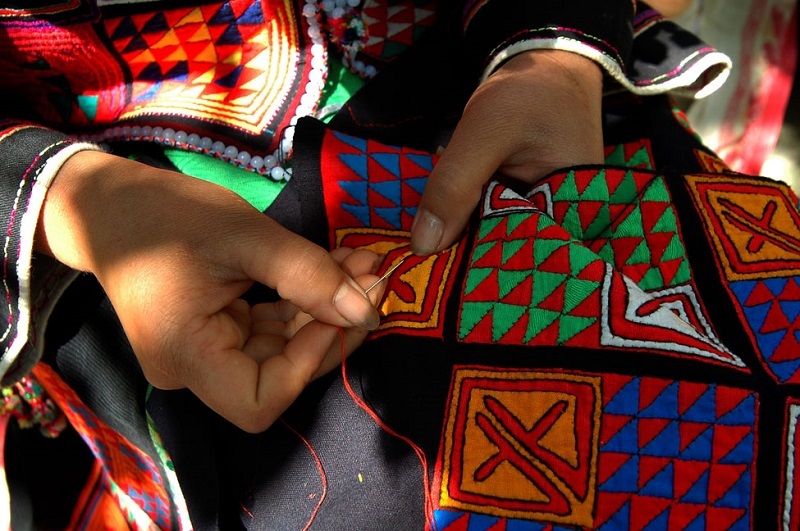 Women’s shirts and skirts are embroidered with colorful images of birds and flowers. The large sleeves are made of pieces of varicolored cloth. Lung Thi Minh of Sang Pa A hamlet says that despite minor differences, the costumes of the Lo Lo Den and the Lo Lo Hoa are both decorated with triangle, square, and diamond patterns. “The costumes of the Lo Lo are complicated. The dominant colors are red, white, and pink. The pants of men and women are slightly different. Women’s pants have a cloth covering their back,” Minh said. The Lo Lo have both a spoken and a written language. Their ancestors wrote on wood or leather to hand down legends and folk songs about everything from natural and social phenomena to their offspring.